The shale gas boom in the United States has been something of a mixed blessing for independent oil and gas companies. While new technology has opened up vast new areas of exploration and production, natural gas prices have been in a serious slump since peaking in mid 2008 which has created challenges for companies seeking to justify the cost of shale production. At recent prices, shale plays may be delivering only marginal profitability at best given the high cost of production. However, while natural gas prices remain stuck in a trading range near $4/mcf, crude oil prices are approaching $90/barrel, a level not seen in over two years. Although one barrel of oil has approximately six times the energy content of one mcf of natural gas, the typical ratio between the two commodities has historically hovered at around ten, although wild fluctuations do occur from time to time. 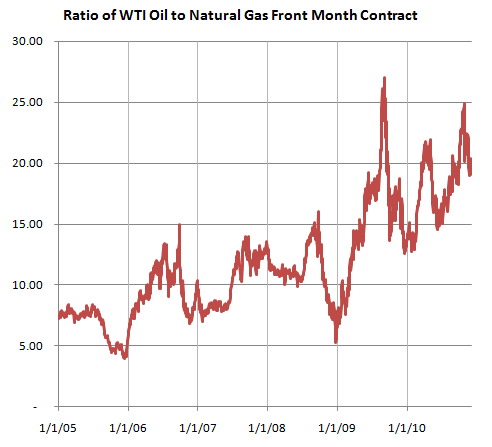 In an article published in late 2009, we provided a long term view of the oil to natural gas ratio and considered whether substitution would occur given the cheapness of gas vs. oil on an energy equivalent basis. Even if substitution does not occur on the consumption side, price signals could eventually shift production from natural gas to oil in order to correct the imbalance. According to a recent article in The Financial Times, a shift from natural gas to oil production may be starting to take place. Independent oil and gas companies are taking steps to sell natural gas assets in order to participate in the booming market for shale oil. While the big story in shale has been natural gas, it is also possible to extract oil using newer technology. 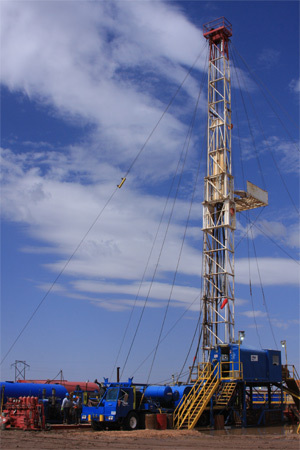 According to sources cited in the article, the number of rigs drilling for oil in the United States (shale and conventional) has climbed from 180 in May 2009 to 720 in November 2010. During the time period presented above, the average oil to gas ratio was 11.8, although the measure fluctuated wildly between a low of 4 on December 13, 2005 and a high of 27 on September 3, 2009. A ratio of 20 or higher is a major long term anomaly, but one that has been appearing much more frequently over the past two years. Some potential causes of the high ratio today include the fact that crude oil is a globally traded commodity priced in dollars at a time when OPEC may be getting increasingly nervous about the long term direction of the U.S. dollar. Analysts do not anticipate that OPEC will increase production quotas despite oil breaching the $90 upper limit of the $70 to $90 “comfort zone” previously communicated by the Saudi Oil Minister. Although not directly stated by the Saudis, the Federal Reserve’s $600 billion program of quantitative easing seems to be a likely factor in the upward pressure of crude oil priced in dollar terms. While some speculators may try to forecast the short term price of natural gas and oil, this is likely to be a futile effort for investors. A slightly more promising forecast could be a prediction that the oil to gas ratio cannot indefinitely persist at levels above 20 given the long term average ratio and the underlying fundamental energy content of the two resources. Eventually, substitution by consumers and/or supply changes by producers should bring the ratio down to more normal levels. While the ratio could correct either by a decline in crude oil or an advance in natural gas, the combined effect of OPEC member discomfort with the U.S. Dollar and voracious oil demand by China and other emerging countries is more likely than not to keep an upward bias on oil prices barring a global economic depression. Increased domestic supply by independents shifting from shale gas to shale oil is not likely to materially impact the price of crude oil but could potentially have a more significant impact on the supply of U.S. natural gas production. Since natural gas is not a true global commodity like crude oil, lower domestic supplies of natural gas could result in a greater impact to U.S. gas prices versus the impact of increased shale oil production on global oil prices. In the meantime, for investors interested in natural gas, owning shares of low cost producers able to make money even in the current low pricing environment could mitigate risk while providing benefits in the event of higher gas prices in the long run. We have written about Contango Oil & Gas in the past (click here for the article archive) but recently trimmed the position size slightly as shares have advanced significantly over the past three months. Disclosure: The author owns shares of Contango Oil & Gas Company.